This resource is perfect for a literacy center. 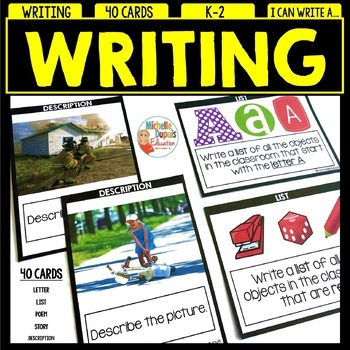 It includes 40 task cards that will get students writing. 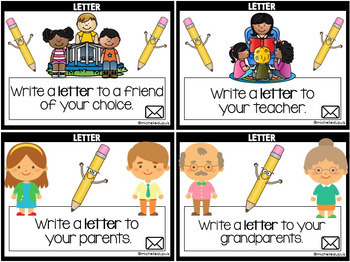 There are eight cards for each category: story, list, poem, letter and description. Each card shows a writing prompt and a picture. Students are more engaged and motivated when given a choice. These cards are perfect for a writing center. 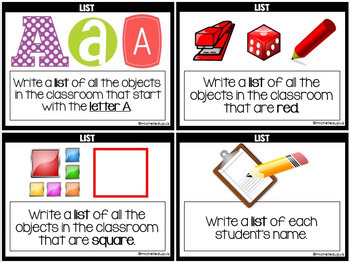 They can be used for whole class writing activities, small group work or one-on-one teaching. Please consider following my store Michelle Dupuis to be notified of new products, sales and freebies. This purchase entitles the buyer to one (1) classroom use only.